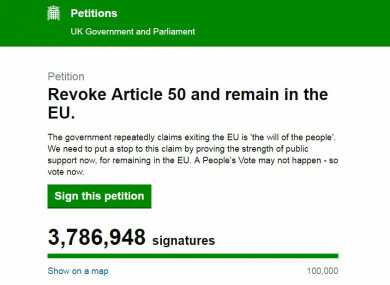 AN ONLINE PETITION that calls for Brexit to be cancelled by revoking Article 50 has gathered 3.7 million signatures. At the time of updating this article, the petition had over 3,786,000 signatures. The British Parliament’s petitions committee tweeted that the rate of signings is the “highest the site has ever had to deal with”, after the website briefly crashed earlier. A House of Commons spokesman said the technical difficulties on parliament’s e-petition website were caused by “a large and sustained load on the system”. “We don’t comment in detail about security measures. We use different techniques – automated and manual – to identify and block signatures from bots, disposable email addresses and other sources that show signs of fraudulent activity. We also monitor signing patterns. The House of Commons pledges to consider all petitions that get more than 100,000 signatures for a debate in the chamber. Email “Petition to reverse Brexit swells to 3.7m signatures, as Commons states that 96% of supporters are British”. Feedback on “Petition to reverse Brexit swells to 3.7m signatures, as Commons states that 96% of supporters are British”.